The makers of Smash Hit have a new free-to-play obsession worth flipping over. Swedish studio Mediocre has become one of my favorite mobile game makers thanks to a pair of seriously addictive original experiences: Smash Hit is a dazzling endless glass-shattering arcade affair, while Does Not Commute is an unexpectedly hilarious game about routing traffic through cities. Despite being very different games, both feature a very similar (and smart) free-to-play model. 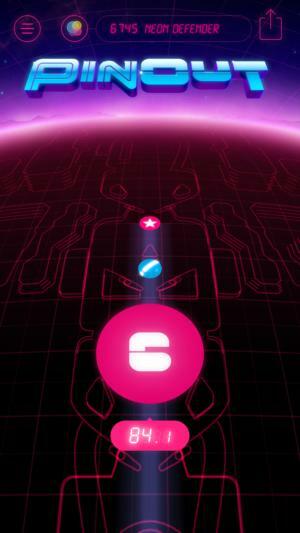 And here’s another: PinOut is the studio’s latest inventive and impeccably-crafted iOS game, and it breaks past the confines of the classic pinball table to turn the familiar flipper-tapping game into an endless experience. 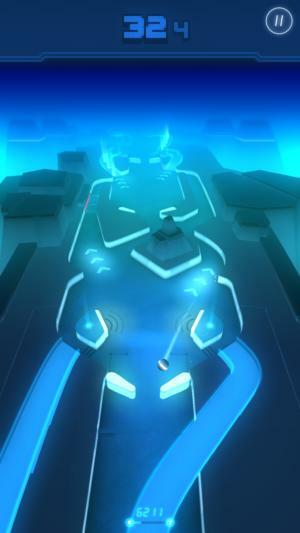 Instead of bouncing the ball off of bumpers for points, you’ll guide it ever ahead across ramps and around obstacles to notch the farthest distance you can before time expires. 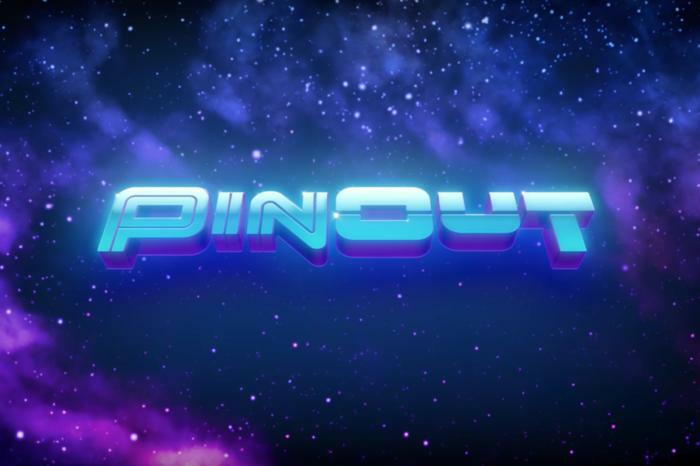 PinOut also scraps the look of classic pinball machines to take on a more stylized, neon-soaked aesthetic, made all the more pleasing when paired with heavy synth beats. The aforementioned free-to-play model also works wonders here, letting you play as much as you’d like for free or opt to spend a couple bucks to add checkpoints. It’s completely optional, yet totally worth it. Looking for a new iPhone obsession? You might find it with PinOut. Here are three ways in which Mediocre’s latest App Store entry delights and dazzles. Grab all the bonus time you can to extend your run. It’s a unique spin: Putting traditionally-designed pinball tables on your iPhone or iPad has proven popular and surprisingly effective, as seen in Zen Pinball for example, but PinOut isn’t that kind of game. 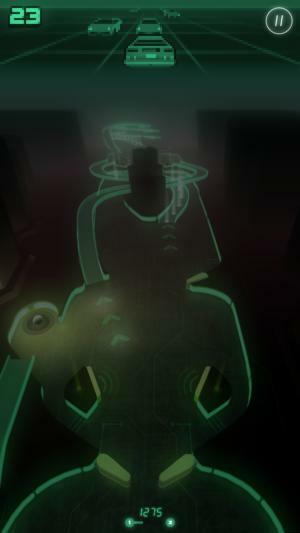 It still has an arcade sensibility about it, but instead of trying to set a max score with the limited balls you’re provided, you’ll instead try to propel the ball as far ahead as possible before time runs out. Luckily, you have control over not only the ball, but also time—to some extent. Certain paths ahead are lined with time bonuses that extend the clock, while other ramps are empty. In other words, you’ll need to flip with precision to make the most of each new area you’re in and ensure that you pick up as much extra time as possible. On the other hand, the goal is to keep progressing forward, so you also can’t dawdle too much trying to get the ball down one particular ramp. Little mini-games up top break up the action while providing extra time to your tally. 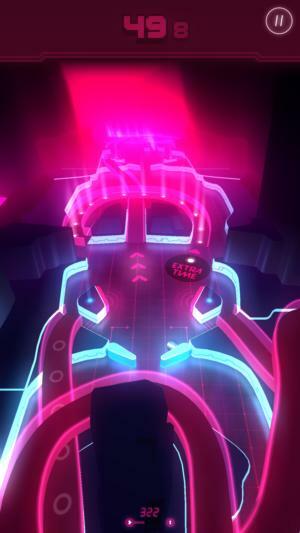 It’s slick and stylish: PinOut has a very Tron-like aesthetic, with the pulsing glow of neon lights in an original digital world. It’s garish in a pleasing, 1980s sort of way, and it fits well with the momentum of the game. As mentioned before, the throbbing synth lines and beats also help in that arena, along with electronic drum-like sound effects that emanate from bounces and hits on the board. While PinOut largely scraps the classic pinball visual language, even adding power-ups that can slow down gameplay or pause the clock, it does keep one very cool tribute to classic tables: mini-games on a wide, pixelated display. You’ll tap left or right to dodge cars in traffic, say, or blast incoming asteroids with a spaceship. They’re simple breaks in the action, but you can earn a lot of extra time in the process. Spend a couple bucks and you’ll unlock checkpoints so you’re not always starting over. It’s free-to-play (...or pay! ): Mediocre really cracked the code for adding a meaningful premium enhancement to a free-to-play game, all without diminishing the free experience. It might not work for all types of games, but it works extremely well for their games, and it does so here again. Essentially, you can play as much as you want without spending a penny, but you’ll have to start over when time runs out. That means you’ll play for longer stretches before seeing newer terrain, and end up playing in those same early levels over and over again. Spending $2, however, adds checkpoints after each completed world, allowing you to pick back up in that spot with the highest time tally you’ve had at that point in the past. This changes the flow of the game, letting you work on polishing your clock count section by section, and pick back up in the spot where you might have the best chance to make some real progress. It’s a worthwhile purchase, for sure, and it not only empowers the game but also helps ensure that Mediocre can keep making gems like this. Yes, please!